Because the Hotel-Standards BIM framework works the way your company works you can choose to incorporate the advanced facilities that fit with your existing work processes. So that as well as being an integrated source for design and build and brand information for your hotel estate you can add functions that will streamline your business and add profit to the operation. Users can customise their screen interface to display the information they are interested in, indeed the Hotel-Standards can do this automatically so that users are presented with the information they use most often. Aggregation and comparison of performance indicator values achieved between sites, contractors, regions etc. Information about existing properties can be included so that there is a complete up-to-date record of the whole estate. It is possible to manipulate this information to generate statistics and reports for internal and external use. For example if you roll out a room refurbishment programme, it will be possible to check its progress across all the relevant hotels. 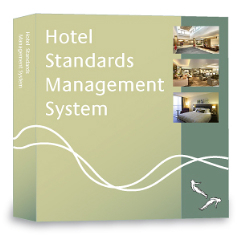 Because Hotel-Standards covers the whole lifecycle of each project from feasibility and initial cost estimates through planning, design, specification, construction, completion and property management and disposal, the resulting premises files include as-built drawings, maintenance manuals, health & safety information, test certificates, asbestos surveys, extensions, planning approvals, local building requirements and legal documents. This enables rapid due diligence procedures when hotels come to be traded. Project teams can carry out some design online and use these outline designs to generate estimated cost and specification schedules.